To the immediate north of Tehran is the Alborz Mountain Range. 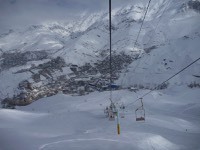 There are a number of ski areas there all within a short drive (40 minutes to an hour or two depending on road conditions and resort) from the city. The airport is to the south of Tehran which means getting across and with the traffic in Tehran, (which has about 14 million people) it is often very slow. 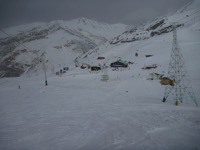 We chose to ski at Shemshak as it has steeper more interesting terrain than at Dizin, the largest ski area in the Middle East. 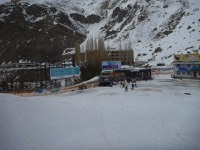 The elevations are for Shemshak 2050 to 3050m ASL and for Dizin it is 2650 to 3600 ASL. Access to Dizin is either 12km further up the road from Shemshak but this road is steep and often closed after snowfalls. 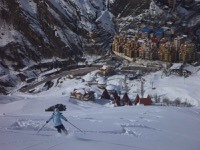 Interestingly you arrive near the top of the resort at 3200m ASL. The access to the base at Dizin is 124km and 2 1/2 hours drive from Tehran. By the time we got there in mid March the snow was a little wet and heavy. We were lucky to have a good snow fall of about 50cm on our first day which held up for a few days but became increasingly soft and spring like. For us it was a surprise to find that the lifts were closed due to it snowing and although it cleared in the afternoon the resort was closed all day. Obviously the best time to be there would be the clodest months, ie January and February. This is a bit of a personal thing as to what you like. We skied mostly on piste or between runs as we would have needed some guidance to go further into the side country or back country. Although in our opinion the terrain here was much more interesting than at Dizin it was limited to a few pitches so after a few days it became a little repetitive. This is certainly a big resort but the runs were not particularly steep and were mostly fairly wide straight runs making the skiing not very challenging or interesting. Roughly speaking there were four separate lifting destinations around a large circus and these were serviced by 2 gondolas and a chair and a pair of T-bars. 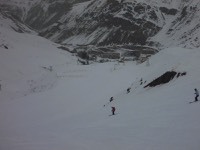 It was a little long since the snow fall to make the off piste skiable but it didn't look particularly exciting. It was a little late in the season to pursue this and finding experienced guides who spoke english would be very difficult from outside Iran. Undoubtedly the terrain is there but whether there is adequate access without long hikes I could not ascertain. One difficulty is there does not seem to be any avalanche information available and just from what was obvious beside Shemshak this could be a major danger. Another problem is to get the good snow you need to be there in the peak of the season so you would be sacrificing a known certainty for this possibly difficult unknown. The costs in Iran are amazingly low due their currency being severely devalued over the last 3 years. When we were there in 2010 we got about 13,000 rial for $1 and now we were getting up to 34,000 and heard of 39,000 recently. At the airport the rate was 31,000 but at our hotel they would only give us 25,000. One difficulty is outside of big cities exchange is almost impossible as there are very few tourists. Also overseas credit cards and ATM cards do not work in Iran so you have to exchange cash and carry cash. 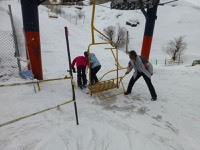 The lift ticket was 300,000 rial or about $10. 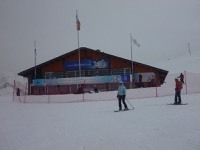 Ski hire was 400,000 per day but the range was very limited to on piste skinny skis. Food and Accommodation were also extremely cheap. We tried to book our hotel over the phone and via the internet but both failed so we went through an agency who charged us double the local rate, ie $72 for a tree person room on the snow in Shemshak at the only hotel there. Most people stay in apartments but from overseas this was impossible to organise. 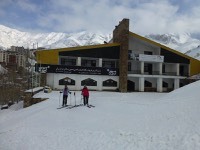 Skiing is certainly a rich persons sport in Iran and it gives you a false impression of the country as a whole but Iranians, rich or poor are almost all extremely helpful and friendly. We met some very generous and interesting locals who made our trip very enjoyable.